Plantains never tasted so good! Heat 2 Tablespoons of Coconut Oil in a pan and add mashed plantain along with 1oz. of crushed pork rinds. Let sit for about 1 minute for bottom layer to crisp up then toss. Remove from pan after another minute. 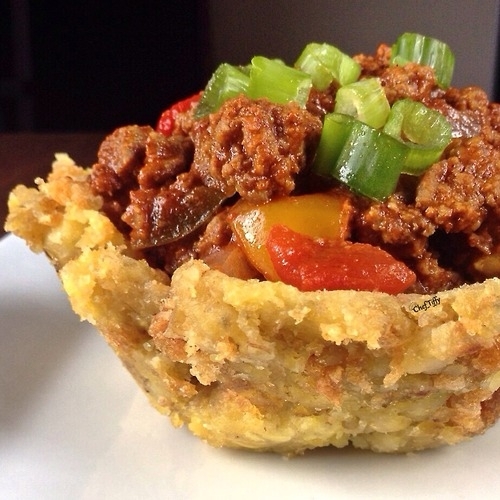 Let cool slightly before forming â€œbowlsâ€ to fill with a saucy protein, as the mofongo tends to dry up. Add 1/4 Cup Crushed Tomatoes, 1 Tablespoon Recaito, 1 Tablespoon Crushed Garlic, 1 teaspoon Ground Cumin and a few dashes of Achiote & Paprika. Chop 1/2 Red Onion, 1 Roasted Red Pepper & 2 JalapeÃ±os (remove seeds for less heat) and add to pan.